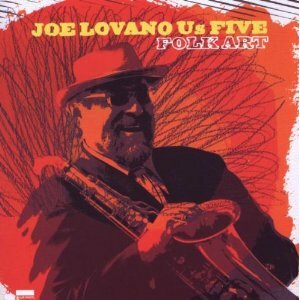 JOE LOVANO formed a new band that he calls US FIVE to record Folk Art, his 22nd effort for Blue Note. In the liberated spirit of 1960s avante-garde and 1970s loft scenes — featuring rising stars Esperanza Spalding on bass, Francisco Mela and Otis Brown III on drums and percussion, and James Weidman on piano — this is Joe’s first album of all original compositions, mixing his native-tongue free jazz elasticity with nuanced Latin grooves and meditative lyricism. The recording captures the edge-of-the-seat group interaction of US5 as the band intuitively interprets Lovano’s compositions in a loose and joyous way.